The class is informative and slower paced, covering all the basics & benefits of inversions & the hammock. 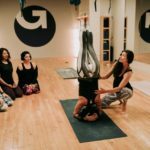 Perfect for the aerial yoga beginner! 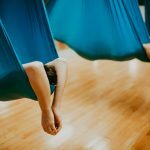 This is an unstructured open time for experienced aerial students to practice on their own and experiment in the silks at their own pace. In this class expect to get an intense core workout, flow through advanced inversions, try out a suspended backbend & have a lot of fun! 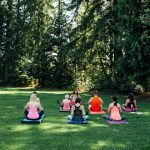 In this all levels yoga class, you will be led through a variety of postures and breathing techniques that revitalize the body physically & mentally. 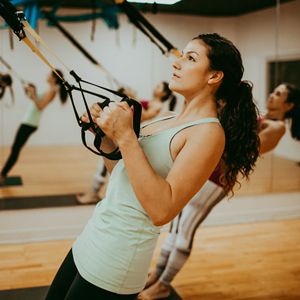 Use TRX Suspension Training® harnesses and your own body weight to build strength, endurance, core awareness and stability. In this class you can expect to focus on deep breathing & stretching, relaxation, meditation & decompression of the spine. This class is perfect for those who wish to learn more about healing and preventing injuries through mindful yoga & Pilates movements. Vinyasa Yoga is a faster paced class where movement is conducted with the pace of the breath. Be prepared to sweat in this class! 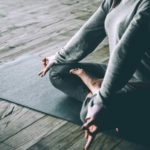 In Yin Yoga, expect to move at a slower pace and hold postures from 2-10 minutes, targeting and opening deep connective tissues, fascia, tendons and joints.